The Church year begins with the Season of Advent. The word Advent comes from the Latin word meaning coming. The Lord is coming. It is a time of preparation that directs our hearts and minds to Christ’s second coming and also to the anniversary of the Lord’s birth on Christmas. 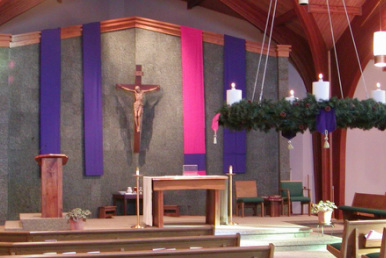 Purple reflects the call of John the Baptist to repent—to turn our hearts and minds to God. The pink of the third Sunday in Advent, Guadete Sunday, reminds us we wait in joyful hope for the promises of God to those who follow his ways. 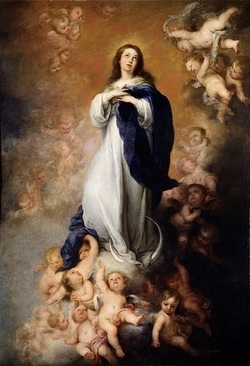 The Solemnity of the Immaculate Conception celebrates Mary's conception, without sin. This age-old belief of the Church was defined by Pope Pius IX in 1854 as an article of revealed truth. Mary was in need of redemption and she was indeed redeemed by the passion and death of Jesus Christ. Only she was freed from original sin before her conception, thus she was immaculately conceived, to become a worthy vessel for the Son of God. Our Lady of Lourdes, "I am the Immaculate Conception"
Mary, Virgin of Guadalupe, Mother of all America, help us be faithful stewards of the great mysteries of God. Help us teach the truth your Son proclaimed and spread love, which is the first commandment and first fruit of the Holy Spirit. Help us confirm our brothers and sisters in the faith. Help us spread hope in eternal life. Help us guard the great spiritual treasures of the members of God's people who are entrusted to us. Accept our willingness to serve unreservedly the cause of your Son, the cause of the Gospel and of peace, based on justice and love among individuals and between peoples. At dawn on December 9, 1531, on Tepeyac Hill near Mexico City, Our Blessed Lady appeared to Juan Diego, an Aztec Indian. Several times Mary sent Juan to the Bishop asking him to build a shrine. Finally the Bishop asked for a sign. Appearing to Juan a fourth time, she directed him to gather fresh roses which he would find growing on the frosty summit of the rocky and barren hill. When Juan opened his tilma (cloak) to reveal the roses, to everyone's amazement, upon the tilma was a miraculous beautiful image of Our Lady exactly as she had appeared on Mount Tepeyac. Juan Diego's cloak, marvelously preserved, can still be seen behind the main altar in the new Basilica of Our Lady of Guadalupe which is near the original Basilica site she requested. The appearance of Our Lady of Guadalupe to Juan Diego in December of 1531 generated the conversions of Mexico, Central and South America. Within 20 years, 9 million people converted to Catholicism.